Rick Riordan, dubbed "storyteller of the gods" by Publishers Weekly, is the author of three #1 New York Times best-selling middle grade series with 45 million copies sold throughout the world: Percy Jackson and the Olympians, based on Greek mythology; the Kane Chronicles, based on Ancient Egyptian mythology; and the Heroes of Olympus, based on Greek and Roman mythology. Rick collaborated with illustrator John Rocco on two best-selling collections of Greek myths for the whole family: Percy Jackson's Greek Gods and Percy Jackson's Greek Heroes. 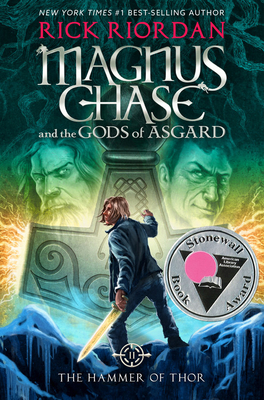 The first book in his Magnus Chase and the Gods of Asgard trilogy based on Norse mythology, The Sword of Summer, also debuted at #1 on the New York Times list. Rick lives in Boston, Massachusetts with his wife and two sons. Follow him on Twitter at @camphalfblood. "Riordan has once again created a reluctant hero who finds himself out of his depth. He stays fairly close to the spirit of the original myths, twisting them for extra comedic effect-Avengers fans may hardly recognize this blustery, red-headed, TV-binge-watching Thor. There's appeal for new readers, but Percy Jackson fans will also undoubtedly snap this up, and there's even some overlap: Magnus' cousin is Annabeth Chase. Buy extra copies, and prepare for the siege.